If you’re the parent of a high school senior, you’ve likely completed the FAFSA by now. And if your child applied to any private colleges, you may have also completed a CSS/Profile. So congratulations! The most difficult part of the financial aid application process is over. You can now sit back, relax, and let the money roll in, right? Wrong! Did you know you can ask for more financial aid? 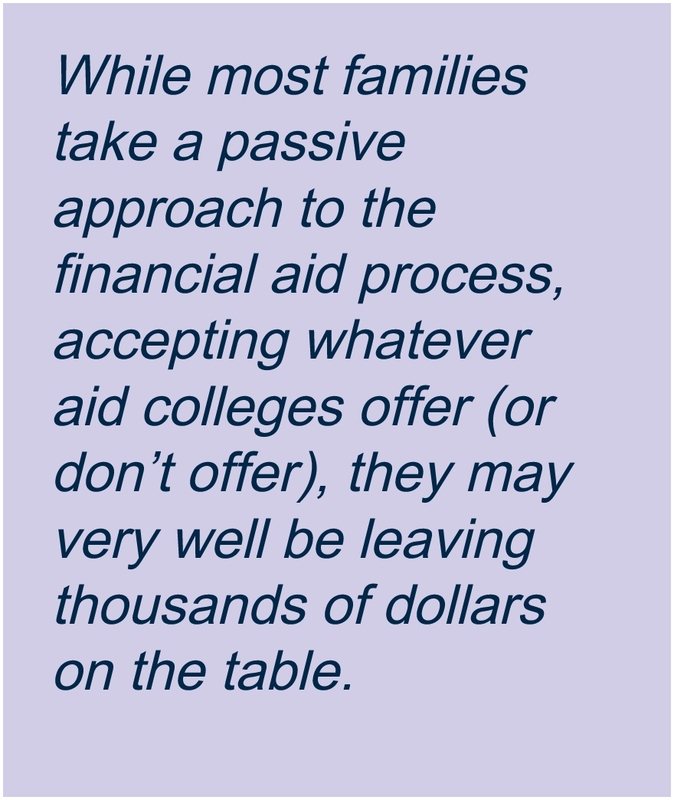 While most families take a passive approach to the financial aid process, accepting whatever aid colleges offer (or don’t offer), they may very well be leaving thousands of dollars on the table. I encourage every College Coach family with whom I work to remember the final step in the financial aid application process: Going back to colleges and asking for more money. Absolutely! And you should. Oftentimes, colleges have more flexibility within their financial aid offers than you would think. And what’s the secret to getting an increased offer? Amazingly, in many cases, all you have to do is ask. At College Coach, our college financial planners counsel families on how to best approach making requests for additional financial assistance. These requests tend to fall into one of two categories: appeals or negotiations. Financial Aid Appeals. A financial aid appeal is a request for additional assistance based upon special financial circumstances a family might have. Perhaps you’ve experienced a recent job loss, last year’s income was artificially inflated by a one-time gain, or you have excessive non-discretionary expenses, like medical or elder care. Circumstances like these are not reflected on the FAFSA, and are great reasons to request a reconsideration of a financial aid offer. Financial Aid Negotiations. Negotiation, in contrast, is not based upon any special financial circumstances, but on how attractive a student is to the schools to which he has applied and what offers he may have received elsewhere. Remember that the college application process is a two-way street: while your child is competing with thousands of other students for acceptance at the college of her choice, colleges are also competing with each other to attract the most qualified candidates to their school. If your child receives a better scholarship offer at one school versus another school, feel free to share that better offer with the school your child really wants to attend and ask if there’s a way to narrow the cost gap to make her attendance more feasible. If your child is a particularly attractive student to the school in question, the school may be willing to increase their offer in order to lure your child away from the competition. Whatever tactic you employ to request additional financial aid, there is no reason not to make the request. The worst a college will do is say “no,” and at that point, you’ll need to decide for yourself whether that particular college is worth the price of admission. With the right approach, however, you’re likely to hear a “yes” from one or more colleges, putting a more affordable college education within reach.